Hand Abhanga is a good way to start learning or getting into the practice because it is easy and quick to learn. The basic principles are straight long strokes along the long bones, circular pressure on the joints. Hands play a pivotal role in life in many ways and those of us lucky enough to have well functioning hands and wrists often take them for granted. We often go through our days without even thinking about the many activities and strain we put our hands under and only when something goes wrong, do we take time out to acknowledge them and to give them some deeper thought. Our wrist and hands consist of 27 bones, 3 nerves (the median, ulnar and radial nerves), the muscles, tendons, fascia and then obviously all the lymph, veins and arteries etc. All of these play an important role in the well being and functioning of the movement of the hands and wrists. Have you noticed how the skin on the front and the back of your hand is slightly different? If not, have a look and feel, the skin at the back of your hand is thinner and more pliable; whereas the skin of the palm of your hand is a little thicker, smoother, doesn’t have any hairs or projections. 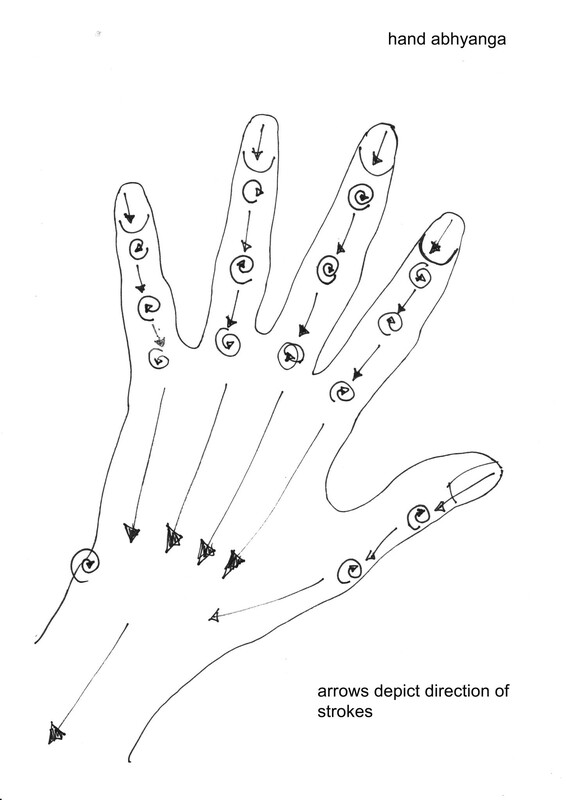 Have a look and get a sense of your fingers now, fingers are one of the densest areas of nerve ending in the body. We constantly use our wrists, hands, and fingers to do so many activities throughout the day and that is why in Ayurveda hand massage is such an important and wonderful practice to get into. Remember that our hands are an extension of Anahata Chakra (our heart centre). Everything we do with our hands should be done from that place of compassion and unconditional love and is something important to remember when we massage ourselves or when we massage others. 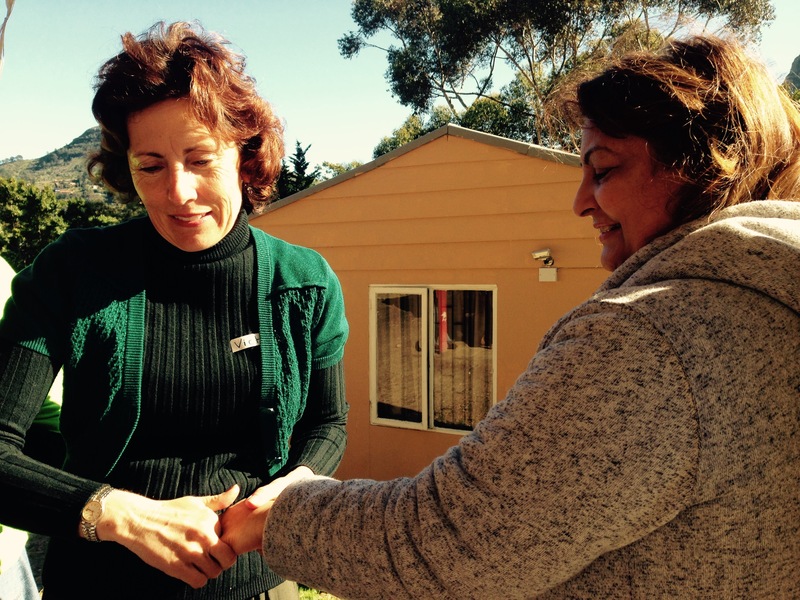 Massage and hand massage specifically is a great and easy way to learn how to give and receive, especially for those who struggle with these concepts – be it giving and or receiving on any level, physical, mental or emotional. By starting simply with the hands, we can start to reawaken the sense of touch and deeper inner connections. So start today and notice how you feel. Is it a practice that comes easily and naturally to you? Do you enjoy it and can you share it easily with others? Before going to bed, warm some oil in your hands, give them a little rub, then the start with one hand, long strokes down the long bones, circular stroke at the joints. You can make it a short quick practices of 3-4 minutes, or you can take more time and turn it into a longer, more luxurious practice. Use hands (and the principles of giving and receiving) as a theme in your yoga class and end it with a quiet hand massage that students give each other. Depending on age kids/teens get them to do hand massage on each other as part of a birthday party programme or as an after school activity and notice how they feel. Most kids love the connection and gentle, stable pressure of massage. Feet are similar to hands, the same massaging principles apply, long strokes down the long bones, circular strokes at the joints. Also a fabulous practice to do before going to sleep at night.